In traditions where the importance of dreaming is understood, the right dream may be your price of admission to the good stuff. It is common in Tibetan tradition for spiritual teachers to ask students to bring them a dream to determine if they are ready to receive important teachings. A student without a dream is regarded as blocked and possibly unclean. He is required to undergo purification and perform practices to reopen his connection with spiritual allies. He is not allowed to continue his studies until he can produce the right dream. Tenzin Wangyal Rinpoche gives a personal example, from the time of his training with Lopon Rinpoche, in his book Tibetan Yogas of Dream and Sleep. 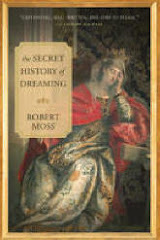 The story is doubly interesting because it involves long-range dream precognition. At 13, as a student,Tenzin dreamed he was handing out slips of paper with the Tibetan syllable A written on them to people boarding a bus. He brought this dream to his teacher, who did not comment, but allowed him to proceed to a further level of instruction. Fifteen years later, waking events caught up with the dream. Invited to travel to the West for the first time, Tenzin found himself assigned to hand out slips of paper with the Tibetan syllable A on them to people boarding a bus. These were to be used in a meditation exercise. When my mother died suddenly, three months later, I was grateful that the dream had prepared me for this event, through our loving exchange in the dream itself, and by how it inspired me to reach out to her and heal some misunderstandings. I flew back to my native country. After the funeral, I went “walkabout” for a few days, and found myself at an Aboriginal housing co-op in a dusty town in the hinterland called Beaudesert. When I started talking about dreams, I was told I needed to talk to Frank. Who was Frank? “Oh, he’s our spirit man.” Frank’s place proved to be three days bush walk away, so this lead seemed like a non-starter. But Frank walked in as I was getting ready to go; shamans are tricky. He invited me down to the pub to talk. He sipped orange juice and sniffed me, literally, checking if I was another white fella trying to rip off his people yet again. Then I told him the dream. His manner changed radically. He sat very still, his eyes blazing like fire opals. 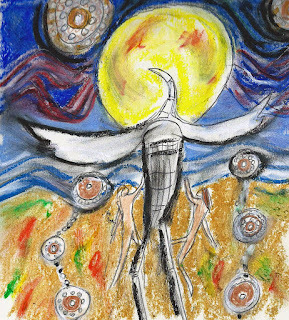 Not for the first, or the last, time in my life, it seemed that a dream had taken me deep inside the Dreaming of a Native people. Because of my dream, Frank volunteered to show me the place of the Bull Eel Dreaming. Skirting quicksand and snakes, after many hours I found myself on the bank of the muddy creek from my dream. No bull eel in evidence that day, which was fine with me. 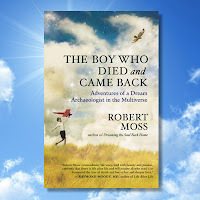 Text adapted from The Boy Who Died and Came Back by Robert Moss. Published by New World Library.